John A. Rawlins, General USA / Secretary of War (Grant). 1831-69. IL. Served as Grant's Aide de Camp & Chief of Staff (1861-65) & Secretary of War (1869). Died in office of TB. "Any United States Charter Steamer will pass Asst. Surg. A. A. Bean, 114th Ohio Vol. 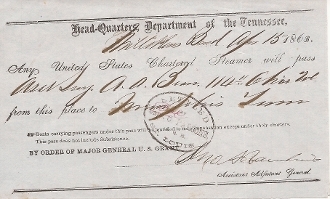 from this place to Memphis Tenn.
By order of Major General U. S. Grant"..."